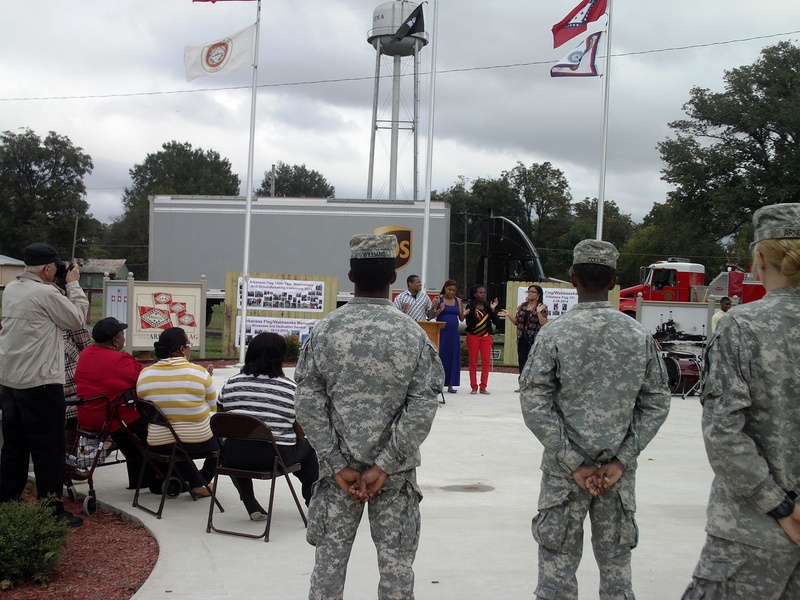 The Ceremony was held at Wabbaseka City Park in Wabbaseka, Arkansas on Sunday, October 12, 2014 from 2:30 – 3:30 pm. The ceremony commemorated the one year establishment of the Memorial Plaza in Wabbaseka’s Community Park. The memorial is the concept of author Jason Irby who grew up and attended schools in Wabbaseka. The University of Arkansas at Pine Bluff’s (UAPB) ROTC Department participated by performing the “Raising of the Flags” ceremony and honors. Three flag poles adorn the variation of historic and patriotic flags. The original 1913 Arkansas flag design by Ms. Willie K. Hocker and the second 1913 modified design approved by Ms. Hocker are displayed. The USA, Arkansas 1924 design, MIA-POW and the Five Branch Military Flag are on display at the Arkansas Flag/Wabbaseka Memorial Plaza. 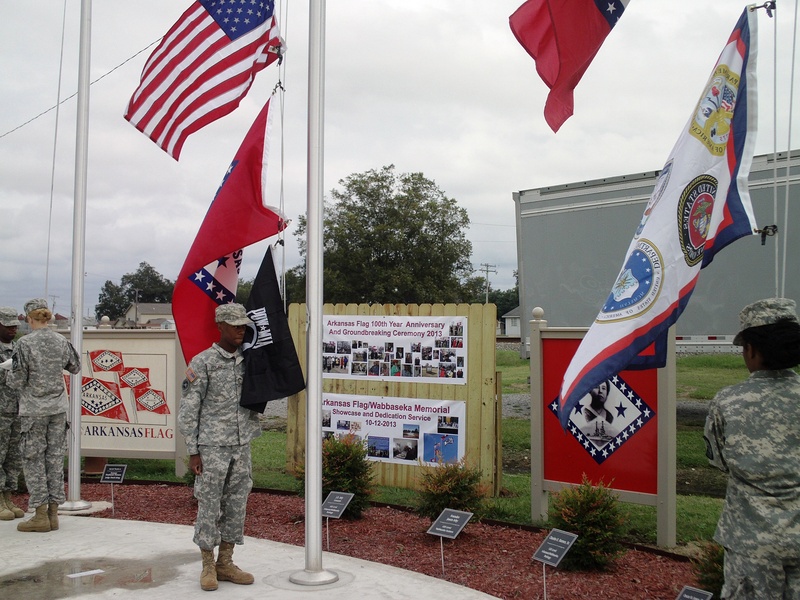 The UAPB Art Department assisted in the designing and developing of the information and exhibit panels at the Arkansas Flag/Wabbaseka Memorial Plaza. A product of the University of Arkansas system, Irby received his Bachelors and Masters degrees in the School of Mass Communication from the University of Arkansas at Little Rock (UALR). He has authored a series of publications entitled Love Within Life which includes several references to his life in and admiration of Arkansas’ resources, beauty, and people. Special guests and presenters included Kerry Baldwin of the Arkansas Secretary of State Office, Tatyana Oyinloye of the Arkansas History Commission, Dan F. Littlefield of UALR’s Sequoyah National Research Center, UPS, and Wabbaseka Municipal Officials. Byron and Company performed a variety of musical selections. For more information, contact Jason Irby at 501-907-6710 or visit www.jasonirby.wordpress.com. This entry was tagged Arkansas, Arkansas Flag, Arkansas Flag/Wabbaseka Memorial Inaugural Ceremony, Arkansas Flag/Wabbaskea Memorial's Inaugural Year Celebration, Arkansas History Commission, Arkansas Secretary of State office, Byron and Company, Dan F. Littlefield, Jason Irby, Love Within Life, Memorial Plaza, School of Mass Communication, Tatyana Oyinloye, UALR’s Sequoyah National Research Center, UAPB, UAPB Art Department, UAPB ROTC, University of Arkansas at Little Rock, University of Arkansas at Pine Bluff, Wabbaseka City Park, Wabbaseka Memorial, Wabbaseka Memorial Inagural Ceremony, Willie K. Hocker. Bookmark the permalink.